I don't understand why the share price move up so much after the listing of Rights Share when the share price was so low before the issuance of Rights Shares. Anyhow, I did make some profit from holding this for less than three months, have all sold by today. 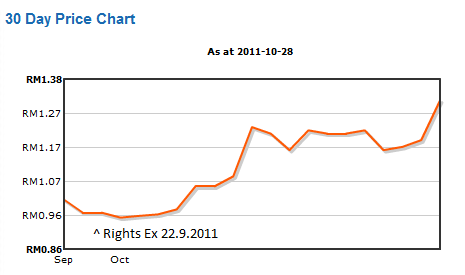 Should anyone continue to buy RSAWIT at above RM1.40 (new 52W High today at RM1.43) as the Bonus issue of 1:1 will be ex by coming 9th November 2011. Lets wait and see. Disclaimer: This is a personal finance blog, reflecting my personal views. All information provided here, including recommendations (if any), should be treated for informational purposes only. The blog owner should not be held liable for any informational errors, incompleteness, or delays, or for any actions taken in connection on information contained herein. To sourplum, good for you. If you bought at RM1.47 and keep now, value is almost RM2.00 damn good ROI within two weeks. Question... to keep or to take profit? but still i'm not sure if it is good decision or not. anyway thanks for sharing the info here.